Samsung's Instinct may be the best stab at the coveted title of iPhone killah this CTIA. The 3.1-inch touchscreen phone has localized haptic feedback, plus three hard navigation keys. If it sounds familiar, it's because we've seen versions of it before, but only in Korea. 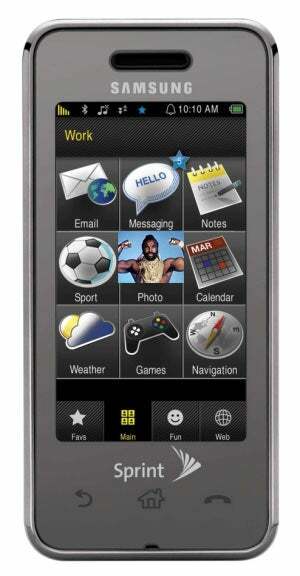 Mind you, this is not the LG Prada-ripoff Samsung F480, which had a much smaller touchscreen. UPDATE: Check out our full Samsung Instinct review HERE. Samsung&apos;s Anycall Haptic Phone: 22 Ways to Say "I Feel You"
with audible caller ID, expandable memory up to 8 GB and a 2.0MP camera with camcorder. Voice to Action button providing many functions using voice activation including call, text, picture messaging, traffic, movie, sports, news and search. Access to corporate and consumer (POP3) email including AOL, Gmail and Yahoo!